"Just a moment....Just a moment. I've just picked up a fault in the AE-35 Unit. Its going to go 100 percent failure within 72 hours." With those words from HAL, we first learned of something called the AE-35 Unit...and are given some indication of problems to come. The quiet life on the Discovery was about to change. So what was the AE-35 Unit? And what did it do? 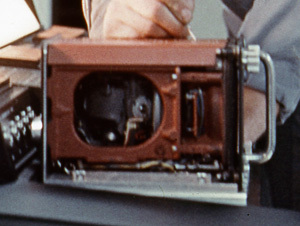 Well, based on descriptions in the novel and on references in the film, the AE-35 Unit was a control unit which kept the radio antennae pointed where it was supposed to be pointed. The term AE-35 most likely stood for Azimuth & Elevation with the -35 being some sort of model or version number designator. Since the AE-35 unit kept the antennae stabilized in azimuth and elevation, it most likely was a gyro control system. 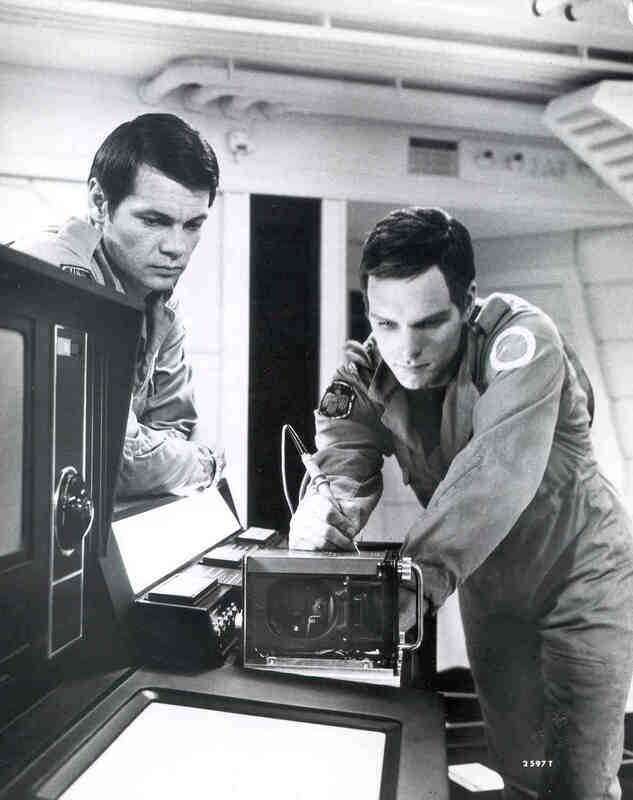 (Note that the term AE-35 referred to the black box that was removed from the antenna structure and not the antennae structure itself, as was erroneously used in the sequel 2010). The AE-35 unit, with cover removed, on the Test Bench in the Pod Bay. The AE-35 unit is a rather interesting unit (once the cover is removed), and as we find out a very important piece which must operate properly for Discovery's mission to proceed smoothly. 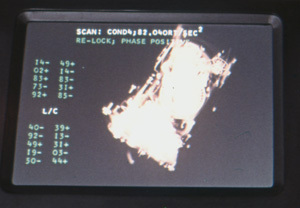 In addition to the unit in the Antenna, there are at least 3 additional AE-35 units in the storage area of the Discovery (based on images cut from the final version of the film). Three AE-35 Units in the Storage Area. I always thought the AE-35 unit looked fascinating, and many times wondered what was actually used to make it. It looked so real...but of course, so did everything else in the film. But it also looked as if it might have been some piece of real equipment that was converted into the AE-35 design. For many years I wondered what could have been used. I kinda thought the insides looked like a gyro...which make sense since that was its function in the film. Recently, I started to look closely at the unit. As a prop, the AE-35 unit is amazing. It has all the very minute details that one doesn't really focus on when looking at it, but those details tell the mind this thing really works...or could really work in the year 2001. 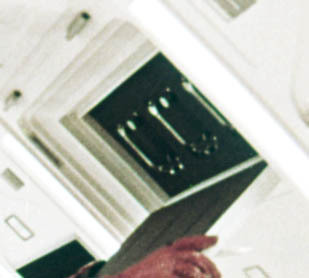 Scenes in the film show the AE-35 unit with its cover on during the EVA, with its cover removed when the astronauts are testing it on the diagnostic bench in the pod bay. We also see 3-dimensional rotating x-ray images of it, and circuit testing images. I began studying those images in detail. Just a moment...Just a moment. I've just discovered what was used to make the AE-35 Unit. Suddenly, I realized that those x-ray images we see in the film are actual x-rays of the AE-35 prop. They, along with the wire outline images (shown in pictures which followed the x-ray images) and the images of the unit with its cover removed, provide clues to what the unit was originally, as they offer a glimpse into the interior of the unit. 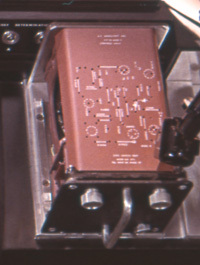 The x-ray images show interior details on parts buried deep inside the unit. That type of detail could only come from a real piece of hardware. 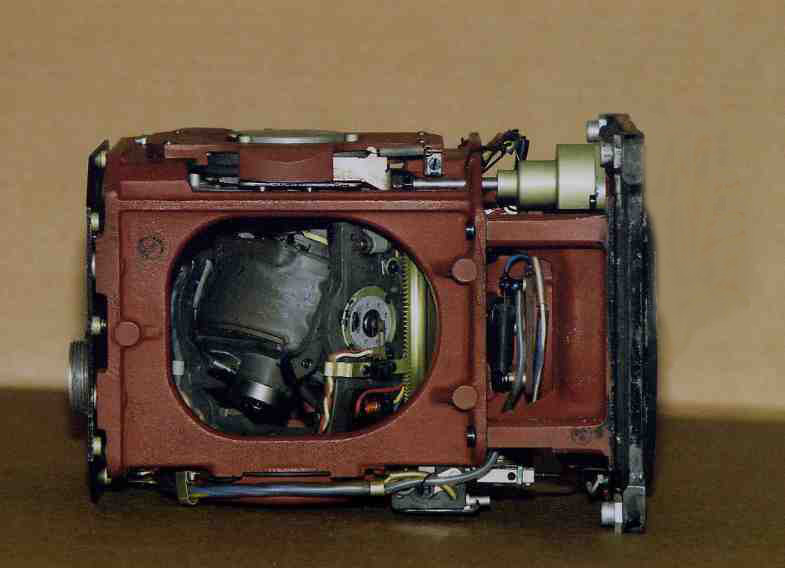 The insides of the AE-35 unit is a real gyro, as I suspected. But what type, and from where? Based on all of the information I could gather from countless hours of staring at images in the film, I started looking at possible candidates. I acquired many gyro units as potential candidates for inspection (a rather expensive exercise). There are a few that are very similar but have subtle differences. It took me a while to sort these differences out. I ultimately found a unit that matches the internal parts of the AE-35 unit. This is the gyro unit of the same type as was used to make the original AE-35 Unit. The replication of the AE-35 unit will proceed rather quickly now. The gyro unit will be modified as needed, and installed in an enclosure. A handle, control knobs, electrical connectors, and base mounting will be added. The base mounting of the original was rather detailed. It had machined metal rails which dovetailed into matching rails in the Antennae cavity, which held the AE-35 Unit, There were also matching rails on the diagnostic bench in the pod bay to hold the AE-35 unit to the bench in the weightless environment. All this was extremely well made. So why do all this? Why make an AE-35 Unit? Well, I thought the completed spacesuit should have something in its gloved hand for display. What better than an AE-35 Unit? More photos will be added as work progresses.